Growing Ideas with Johnny's Selected Seeds: Jean-Martin Fortier's "The Market Gardener"
Jean-Martin Fortier's "The Market Gardener"
Jean-Martin Fortier is a market farmer in Quebec who, along with his wife, Maude-Hélène Desroches, and their two children, operates Les Jardins de la Grelinette. 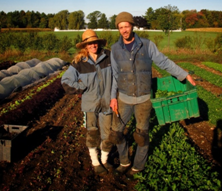 After 10 years of refining their craft, they’re able to support a CSA with over 140 members and attend two local farmers’ markets weekly. Jean-Martin has clearly been influenced by the writings of Eliot Coleman, as many of his methods are straight out of Eliot's playbooks. As a result, he employs many tools that were developed by Eliot and Johnny's. He has even named his farm after one of them. 'La Grelinette' is the French name for what we call the Broadfork, a two-handled fork invented in France by André Grelin in 1946. The Broadfork was redeveloped in 1998 by Eliot Coleman and Johnny's Selected Seeds. 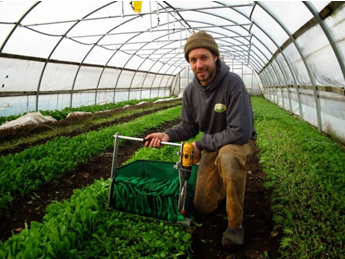 For many years now Jean-Martin has been describing his growing strategies and use of scale-appropriate technology on a website and blog, where he promotes the idea of farming with hand tools (i.e., they don't have tractor) as an alternative way of farming professionally. 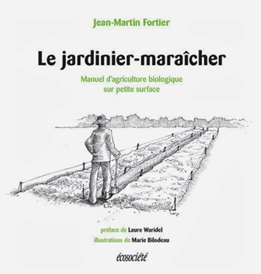 In 2012, Jean-Martin published Le jardinier-maraîcher, a 200 page manual for small-acreage organic agriculture. The book quickly became a Canadian best-seller and has sold more than 15,000 copies. In it, he describes (in French) the technical aspects of his operation and the tools that they use to make their labor efficient and cost-effective. Many of the drawings in the book illustrate Johnny's tools, including Broadforks (of course), the Tilther, several seeders including the Six Row Seeder, the Bed Prep Rake, Collinear and Stirrup Hoes, and the Wheel Hoe. His approach is that 'small is beautiful'. That is to say that he keeps his operation small yet profitable, but it is more than that. It is also about enjoying life, enjoying what you do, and remembering to take time off regularly so that your work remains enjoyable. All this is feasible, he stresses, if your operation is super efficient all the way through. 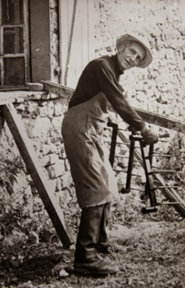 In 2013, Jean-Martin also set out to publish an English version of Le jardinier-maraîcher, and in January of 2014, The Market Gardener was published. “Jean-Martin Fortier extols the virtues of being small-scale, and expertly details the use of scale-appropriate tools (such as Broadforks, seeders, hoes, flame weeders, low tunnels, high tunnels, and many other unique tools) designed specifically for this brand of farming. Jean-Martin remains a tools collaborator and field tester for Johnny's; we are proud to carry this fine publication in our line of books. You can find The Market Gardener on our website here.